Students march with posters supporting gun control. 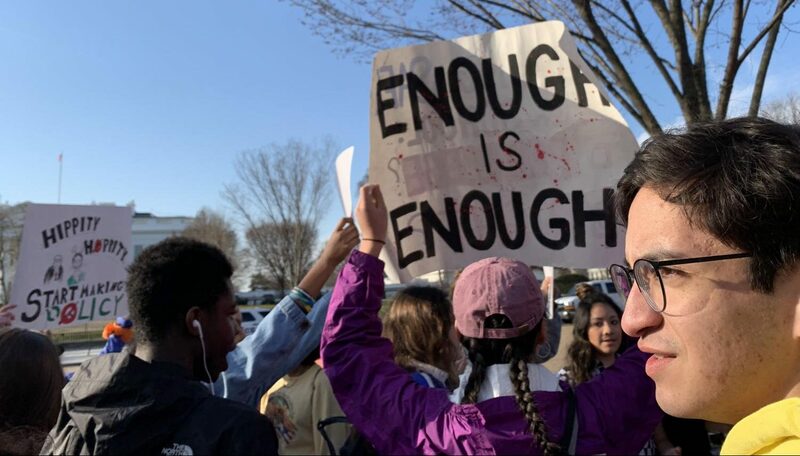 On March 14, 2019, one year after a monumental walkout in response to the mass shooting that occurred at Marjory Stoneman Douglas High School in Parkland, Fla. on February 14, 2018, students from schools in the DMV area marched again. The students participated in a march and rally in Washington, D.C, and sat silently for 17 minutes in front of the White House, a symbolic demonstration to honor the victims of the Stoneman Douglas shooting. During the event, guests gave speeches in front of the crowd, including many leaders from the student activist organization, MoCo Students for Change. Last year, after one of the most significant school shootings in history, a student movement in Montgomery County sprang forward. MoCo for Change is the force behind this movement. The organization was founded by students Dani Miller and Michael Solomon shortly after the Stoneman Douglas shooting, and this was the first event that spurred MoCo for Change’s growth. During the county-wide walkout that took place on March 14, 2018, over 8,000 students from the DMV area attended. MoCo for Change has since held many demonstrations and marches to protest gun violence and other social issues. The motivation behind this year’s walkout, though, was more centralized. On Feb. 27, 2019, the House Judiciary Committee passed the Bipartisan Background Checks Act of 2019, commonly known as HR8. The bill, which is now making its way to the Senate, aims to fix the loopholes in America’s current gun purchase laws. “If these laws are passed, they will save lives,” senior Grace Anderson said. Many of RM’s student activists have been outspoken about this piece of legislation. “[Passing legislation] takes a combination of public pressure, and people actually going in and talking to their representatives, making sure that representatives know that we still care about this issue and won’t stop caring about this issue until actual change is made,” sophomore activist Anand Chitnis said. The Senate, which has yet to vote on the bill, currently holds a Republican majority. “Even though it is the Bipartisan Background Checks Bill, it is mostly supported by Democrats,” Chitnis said. Members of MoCo for Change anticipate opposers’ backlash in the Senate and hope that their activism and lobbying efforts will pay off to help HR8 pass the floor. In addition to expanding its positions on recent legislation, the organization has branched out in other ways. The group recently started an “artivism” section of the organization that combines powerful artwork with activism. A recent art exhibition, titled “Memorial to Our Lives”, displayed tee shirts with the names of hundreds of teenage victims of gun violence outside of Bethesda-Chevy Chase High School, and what originally started as a small group of teenagers has now become a full-fledged movement with thousands of students. “We have a really good network within the DMV, and also across the country with March for Our Lives, we’re in touch with the Brady Campaign, we’re in touch with Change the Ref, and a whole bunch of other really great organizations,” Chitnis said. Student’s concerns have heightened after the recent shooting that occurred on March 15, 2019, when a white supremacist gunman killed 49 people in two mosques in Christchurch, New Zealand. The event was considered to be a terrorist attack, and in response, New Zealand is preparing to reform its current gun legislation. As a result of the sudden increase in shootings worldwide, members of MoCo for Change feel that the movement is still just getting started. “With the recent terror attacks in New Zealand… the fact that the leadership there has already said that they’re going to be changing the gun laws, I think that there’s a lot of momentum right now that we hadn’t anticipated,” Gelillo said. However, MoCo for Change is also broadening its focus past gun control. “The big [issue] that we’ve been focusing on within our county is racial discrimination in the [school] boundaries. We’ve been pressing for a redistricting of the high school clusters,” said Chitnis. “That’s a really big goal, and it would change a lot of precedent.” The organization’s website adds on to this, emphasizing the need for redistricting. It states that de facto segregation is “the new norm” in Montgomery County schools. Whether it’s arranging protests or planning lobbying sessions with local Congress members, MoCo for Change marches forward towards a goal of political justice.